Throughout the 13 years of designing websites for clients, we noticed one thing. In terms of design approvals, presenting designs in different ways yields different results. The initial design stage can be a very draggy process, if you do not present your designs the right way, it can give you days or even weeks of headaches. Have you tried any of these? The list can go on. Except #7, most of the rest don’t work. If your client views your design in their image viewer, PDF or Powerpoint, the design will be scaled and may even be skewed in some cases. This causes confusion and misunderstanding when they view the completed website. Placing your design in HTML simulating the completed website seems to work well, but it does not give you a high approval rate – if you do not walk them through. It is hard to make changes to a design if the site has been coded, at most times it is wise to have your client approve the design first before you proceed for coding. Most of us gets the green light verbally, or sometimes non at all! It all turns into a mind game, we wonder if we can “really” proceed for coding or continue wasting valuable time waiting for the client to say OK. Wouldn’t it be great if you can provide your client with an easy way to approve the design by clicking one button? We’re creating a new app to help you present your designs better and get a higher rate of approval. This app also lets you store all your designs and its versions in one place, making managing your designs a joy. 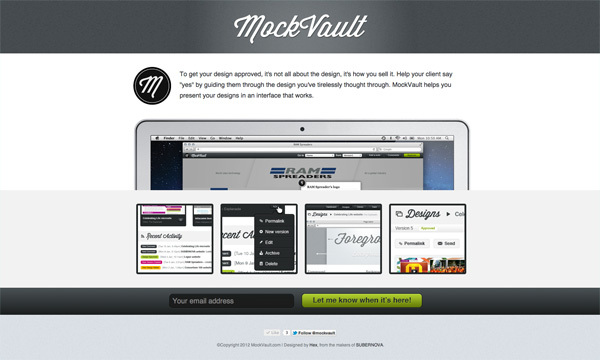 We call it MockVault. Check out the site, signup, follow us and be amongst the first to know when it’s here!